The developments in Ukraine have again demonstrated the poor state the European Union finds itself institutionally. 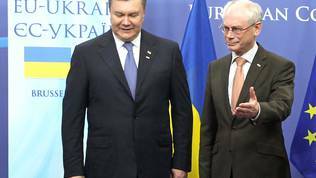 The way the Union mediated in the negotiations between the opposition and the rulers in Ukraine a week ago again revealed the double identity of the EU, especially in terms of its foreign policy. In spite of multiannual efforts at the highest European institutional level, embodied in lady Ashton, Commissioner Stefan Fule, even President Barroso, the European Parliament and the European Council president, to no avail until from the EU's face detached the leading powers - Germany, France and Poland. After the striking of a deal between the two warring parties, Mr Van Rompuy came up with a special statement in which he said that "This agreement was facilitated by important work by the Foreign Ministers of France, Germany, Poland and the Special Representative of the President of Russia and based on the persistent efforts during the last two months by High Representative Ashton and Commissioner Füle. 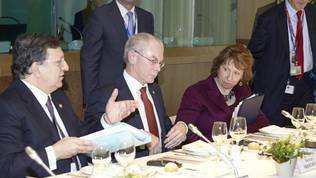 The EU continues to stand ready to support Ukraine". This sounds like tiny inadequacy against the backdrop of the crisis that unfolded afterwards with the disappearance of President Yanukovych and Russia's military aggression on the Crimea. Against the backdrop of previous and not so distant experience, however, this inadequacy seems like a huge flaw in the EU's architecture, especially after the decade-long effort to create something more than a loose union of states with various, but here and there common interests, and also against the backdrop of the recently renewed calls for a new opening of the treaties for repairs. The current situation in Russia's "near abroad", which, in fact, is also the closest neighbourhood of the EU, is due mainly to a series of errors on behalf of the EU and the member states in particular. Building up on the great illusion of the free world that the Berlin wall had fallen for Russia, too, the EU has been working with the conviction that Russia is a country that had made its strategic choice that being modernisation, democracy, pragmatism. Alas, Vladimir Putin's presidency has given enough signals in the past decade that this is not and will not be the case. The EU-Russia relations rested legally on the partnership and cooperation agreement of 1994 which, though, expired in 2008. Even then it was clear that a renewal will prove a huge challenge. Up to date there is no new agreement. At European institutional level it has been worked on the basis of an agreement for modernisation, but the latest EU-Russia summits showed that work is only for the sake of appearances and the dynamics, but also the agenda, were entirely dictated by Moscow. Moreover, the last summit between the two parties on January 28th showed that Russia had entirely lost interest to play that game after it humiliatingly reduced the agenda to just a couple of hours instead of the usually two days. 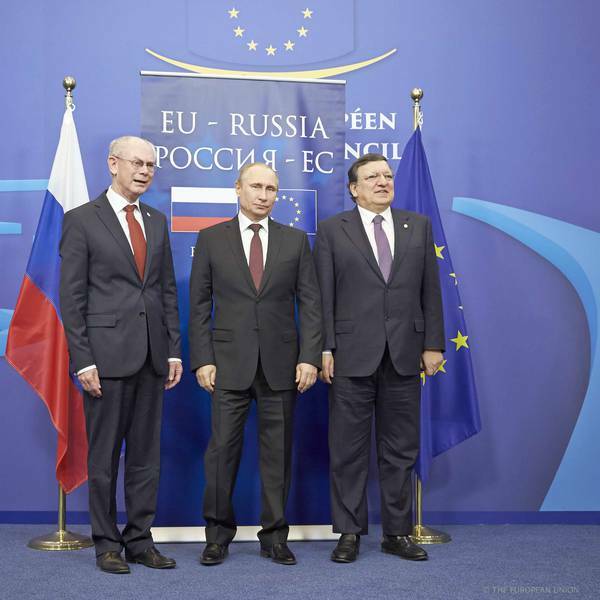 This demonstrated that Putin has nothing more to discuss with the presidents Barroso and Herman Van Rompuy because nothing depends on them. And it does not because the member states never dared to fill their positions with content out of fear that this might be interpreted as a loss of sovereignty. The reason is that the EU never paid attention on what has been going on in Russia and did not believe it was necessary to build a comprehensive strategy toward this country, especially after it raised as a priority one of its foreign policies - that toward the Eastern Partnership countries. But it was a priority policy only during the rotating presidencies of those member states that are most committed to it - Sweden, Poland, Lithuania. During the rest of the time, the EU was digging deep into its own problems. In this way, with changing priority and lack of direction, the EU missed its chance to unite its policy toward the Eastern Partnership with a strategy toward Russia, which either way go hand in hand because it is clear even for kids that the Eastern Partnership countries are completely dependent on Moscow. A dependence clearly demonstrated many times via several trade blockades against Moldova, Georgia, Ukraine and last but not least the five-day war in Georgia in 2008. The situation in 2014 strongly reminds of the conflict of August 2008 when Russia invaded South Ossetia to prevent the accession of the autonomous region, one of the warmed up frozen conflicts in the Caucasus, to Georgia. Then the EU reacted swiftly, although the Lisbon Treaty had still not been in force and the functions of the high representative for foreign policy and security were not enhanced to respond to Henry Kissinger's question 'Does the EU have a number' to call when an important decision has to be taken. Then, high representative was Javier Solana and at the helm of the much stronger rotating presidency of the Council was France. After pressure by Solana and the French presidency, on September 1st an extraordinary EU summit took place dedicated precisely on the situation in Georgia and Russia's military intervention. The leaders agreed during the summit to send a monitoring mission to follow the implementation of the earlier agreed deal with the mediation of the EU. Now a high representative of the EU for the foreign policy is Lady Catherine Ashton, assisted by Enlargement and Neighbourhood Commissioner Stefan Fule and at the helm of the much weakened after the Lisbon Treaty rotating presidency is Greece - the country that pushed the EU into a new cycle of introversion and internal reconstruction. Although, much before the situation in Ukraine deteriorated dramatically Moscow offered a trialogue, the EU refused and that deprived the Union of the possibility to be an equal partner in shaping the fate of a region that is in its closest vicinity. The tensions had been rising with months, the bloodshed was becoming more frequent and Russia was tightening the noose around Ukraine's neck, but the EU was passive, apart from the series of empty statements by Lady Ashton, the Europarliament or the Commission. The Ukraine issue was on the agenda of several meetings of the foreign minsters, but an extraordinary meeting was called for as late as March 3rd - two days after Russia practically declared war to Ukraine. The EU not only did not foresee such a scenario, but it proved completely blind for the bigger picture - withdrawing United States from the global scene because of still unforgotten tainted glory from the presidency of George Bush Junior with the wars in Afghanistan, Iraq and, more generally, the war on terror. But also because of the gigantic debts which regularly possess the American domestic politics. The Middle East is burning with the ugly war in Syria, systemically fuelled precisely by Russia. The unresolved conflict between Israelis and Palestinians, Iran's nuclear programme, the instable Iraq, the growingly authoritarian Turkey. To all this we should add the explosive Bosnia and also the hesitating Great Britain. All this has opened to the dictator Vladimir Putin a broad field for action and has outlined the civilisational gap. 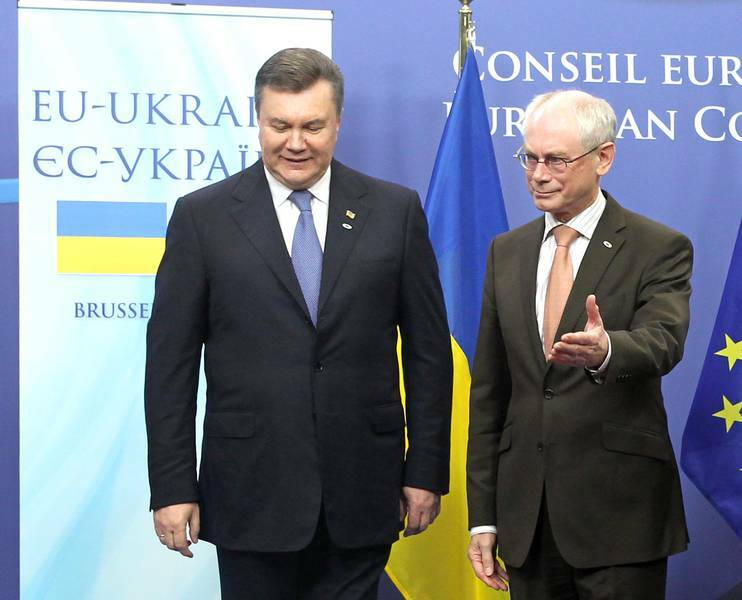 Ukraine is a huge stake and holds the key for the EU-Russia relations. It is not South Ossetia, but can turn into a country with at least one pocket of a frozen conflict in the Crimea or elsewhere. International arrangements cannot solve the civilisational differences between the free world and authoritarian Russia because for the latter human rights are out of the equation, while for the developed world they are the unknown that is being sought. 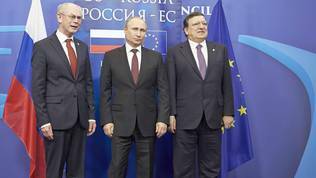 The solution of the situation in Ukraine does not affect only EU and Russia. Turkey, too, has stakes there with which the EU also has choked relations. 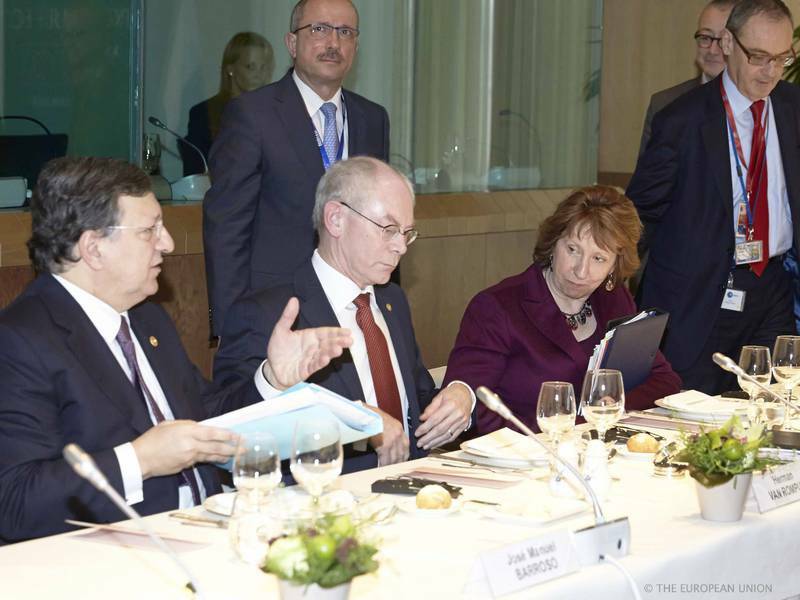 Last year, under the initiative of President Barroso and President Van Rompuy, a special EU summit took place on energy and taxation. The numbers unequivocally showed that the European economy is stifled by the high prices of energy resources, a significant part of which come precisely from Russia. However, nothing followed beyond the renewed calls for the establishment of a genuine common market for energy and building of infrastructure that can help the most vulnerable member states along the eastern periphery of the Union to withstand a gas war. And also, as it proved necessary, to be able to survive economic sanctions imposed against Russia as a way to punish Russia's violation of international agreements and standards. Although it looks with tied hands and soft legs, the EU can and should do more than just disperse declarations with content that makes dictators laugh. In the short term, the Union should immediately and at the highest level convene to discuss an action plan [before this article was translated in English Herman Van Rompuy officially announced an emergency EU summit on Thursday]. In the mid-term, an urgent discussion of a common strategy should commence for the relations with Russia, based on a clearly defined road map and without any compromises with EU's values. 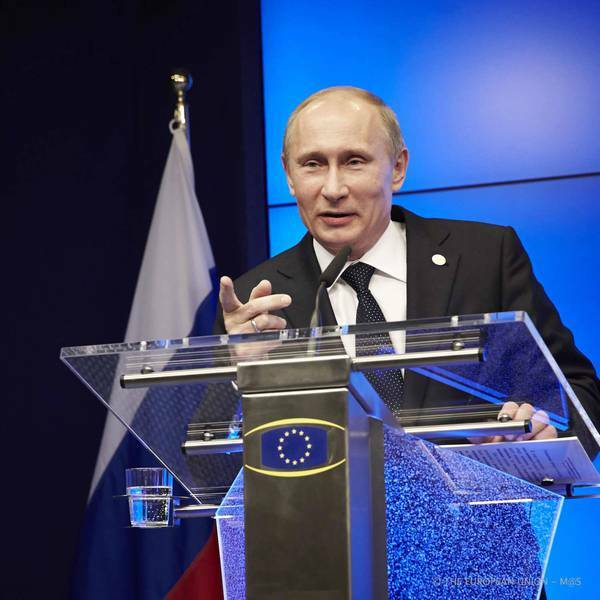 For the sake of good neighbourly relations, the EU closed its eyes for the violations of human rights in Russia and used its weight to end successfully the 18-years long accession of Russia to the World Trade Organisation. The EU learnt the hard way from the Arab spring that pragmatism toward dictators may bring some short-term benefits, but it creates a huge mine filed in the longer term. The same is valid for Russia. 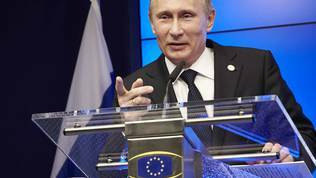 The EU and the European media community did not believe till the very last moment that Putin was capable of what he is currently doing. The reason lies precisely in the identity disorder of the Union. Ashton speaks after some of the top diplomats of the big EU powers have already spoken out, completely ignoring her role. Talking happens without coordination of positions, without an analysis of the situation and without any B-plans. That is why, in the longer term, while treaty changes are discussed with the aim to deepen the integration in the euro area, the EU should start debating the creation of a genuinely common foreign policy. Otherwise, it will burn out because of its own impotence to decide where the fire extinguisher should stand. One of the biggest lessons from the EU enlargement in the past decade is that the former communist satellites served as a buffer zone to old Europe. Alas, with their accession to the EU they imported some of the inherited problems with Russia. Something that Europe hoped will fade away with time and Russia used to deepen it and to spearhead a division in the fragile societies along the axis pro-Europeans vs pro-Russians. What should have been done was to hold a serious conversation about the communist legacy to enable a better future. Because this legacy is poisoning the EU even today - the lack of working institutions, stable democracy, rule of law, media and ideology pluralism, fight against corruption and organised crime and the existence of a strong economic and energy dependence are all legacy from Soviet Russia. It is high time to make a choice between the identities of the EU. Now.